Type letters in order you want them. Which letter do you want larger and in the center? Font Options shown below, right of description. Please allow a full 5 BUSINESS days for this item to ship out, in addition to shipping transit time. If you need your order in hand before 14 days you MUST add the rush fee. 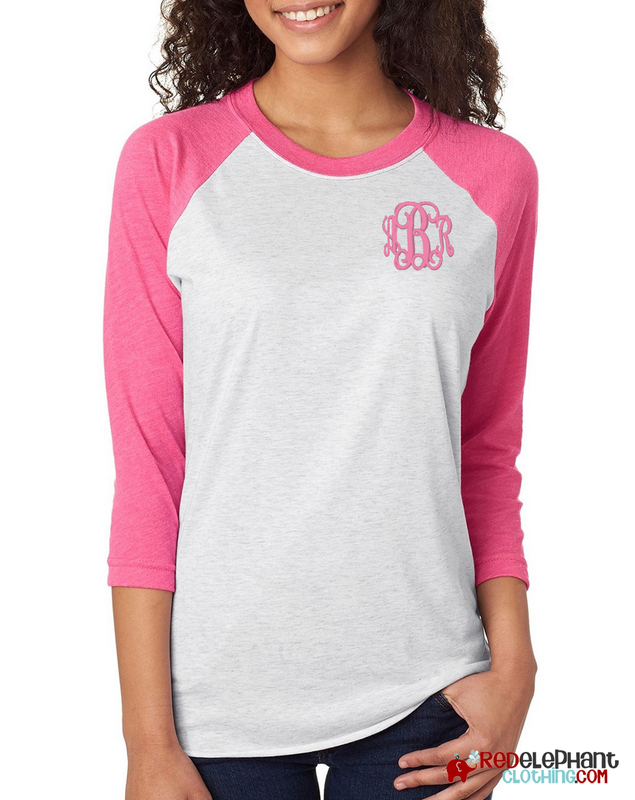 You will love these monogrammed raglan baseball tees! Our embroidered raglan shirts are classic, comfortable and are perfect to pair with jeans for casual days. We can embroider your raglan shirt with your choice of thread and your favorite font to make your new baseball monogram t shirt unique and just for you. Simply choose to add your monogram when ordering. Our personalized raglan features a contrasting 3/4 length sleeve and has a classic unisex fit. Our embroidered raglan tees do run true to size. Your lightweight baseball monogram shirts are made from polyester, cotton, and jersey for a super soft feel.